Ruggero Tita and Caterina Banti (ITA) have been unbeatable in the Nacra 17 in 2018, winning two World Cup events as well as the World Championships. 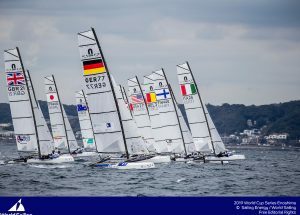 In Aarhus, the scene was set for a memorable Medal Race as the Italians led by a narrow margin over Nathan and Haylee Outteridge (AUS), Santiago Lange and Cecilia Carranza Saroli (ARG) and Lin Ea Cenholt and Christian Peter Lübeck (DEN) who were all in contention for gold. However, a consistent breeze failed to materialise, handing the Italians the world title. The four teams will pick up where they left off in Enoshima, renewing their rivalry in a bid to show who has what it takes on Olympic waters for the first time. Billy Besson and Marie Riou (FRA) make a return to the World Cup Series, following Riou’s successful adventure on-board Dongfeng Race Team during the Volvo Ocean Race. Besson and Riou were the unprecedented favourites for Rio 2016 gold two years ago, but Besson sustained a back injury that severely impacted his performance. The pair won all four World Championships in the Rio quad and will once again be a team to be feared. Further contenders in the Nacra 17 fleet include Rio 2016 silver medallists Jason Waterhouse and Lisa Darmanin (AUS), Ben Saxton and Nicola Boniface (GBR), Gemma Jones and Jason Saunders (NZL) and Bora Gulari and Helena Scutt (USA). Over all 10 classes, the fleets in Enoshima feature many of the leading racers who will be aiming to reign supreme and set a benchmark. 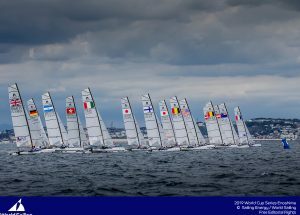 Eight of the World Champions crowned in Aarhus are racing and will be joined by more than 450 sailors from 45 nations. More than 30 Olympic medallists are also competing. Events held on Olympic waters are often strong indicators on what to expect at the Olympic Games. Following the London 2012 test event in 2011, 17 medallists went on to clinch an Olympic medal, while at the Aquece Rio 2015, Rio 2016’s sailing test event, 16 medallists achieved an Olympic medal a year later. 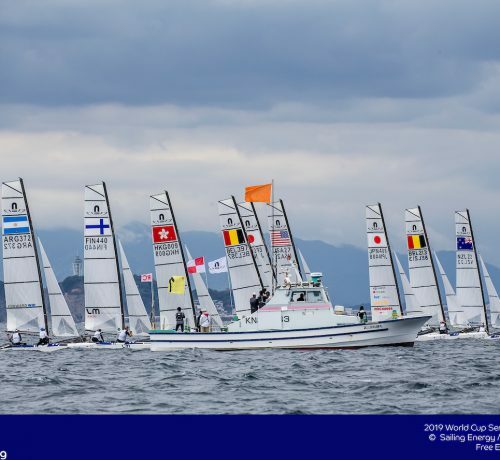 From 9 to 16 September 2018, the Tokyo 2020 Olympic Sailing Competition venue in Enoshima, Japan, will host sailors for the first event of the 2019 World Cup Series. Conditions have been hugely challenging so far for the teams in Enoshima. There was a typhoon a week ago which brought large waves that have remained whether the wind has been higher or lower since. Racing starts at 11:00 local time on Tuesday 11 September. The Men’s and Women’s RS:X, 49er, 49erFX and Nacra 17 competition will conclude on Saturday 15 September with their Medal Races and the Laser, Laser Radial, 470s and Finn will wrap up on Sunday 16.